Distortion is a ‘noise’, an effect that can contain a range of emotions from aggression to devotion. The effect is often used in connection with a note. The more a sound is distorted, the more ‘noise’ and the less tone there is. Full distortion (100% distortion) is only ‘noise’ and no tone. Distortion is a mixture of ‘noise’ and tone. Distortion can be used in all modes and is therefore subject to the same advantages and limitations as the modes in terms of pitch, volumes, sound colours and vowels. Distortion can be used alone or together with other effects, often creaking and rattle. Distortions takes place at the level of the false cord (ventricular folds), level 2 (see ‘Levels of the vocal tract’). The ‘noise’ is created by vibrations of the false folds. 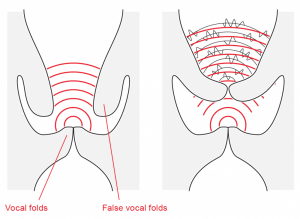 The false folds do not have a flexible and excess mucous membrane as do the true folds which means that they do not vibrate as fast and delicately as the true folds and therefore they produce a distorted sound. The distortion takes place above the true folds which mean you can add lots of volume to this effect without damaging the voice. Once you have created the ‘noise’ by using the false folds you can add a mode to the distortion and thereby gain power and metal. Distortion in Neutral with air gives a quiet volume and a relatively gentle effect. It is often used as an isolated effect in the high part of the voice with a very slow laryngeal vibrato and may have a very suffering sound as if the singer is about to give up. David Bowie and Janis Joplin. Distortion in Neutral without air will give a more non-breathy sound like a howl. The volume can vary from quiet to loud. James Brown, Ray Charles, David Coverdale, Nina Hagen, Brian Johnson (AC/DC), Chris Rea, David Lee Roth, Wilson Pickett, Steven Tyler (Aerosmith), and Stevie Wonder. Distortion is most often used in connection with Curbing. When you hear distortion together with lyrics it is mostly Curbing being used. The volume can be loud or less powerful. The more distortion added, the more strained the singer’s voice sounds. Bryan Adams, Michael Bolton, Joe Cocker, Alice Cooper, Terence Trent D’Arby, Melissa Etheridge, Noddy Holder (Slade), Billy Idol, Dan McCafferty (Nazareth), Paul McCartney, Michael McDonald, Freddie Mercury, Jim Morrison, Alanah Myles, Otis Redding, Rod Stewart, Zak Tell (Clawfinger), Bonnie Tyler, Tom Waits, and Wilson Pickett. Distortion in Overdrive is most obtainable at powerful volumes and is a very powerful effect. It may sound as if the singer is very angry or very upset. It is often used as an isolated effect or on selected words. Mama Cass, Ray Charles, David Coverdale, Etta James, James Hetfield (Metallica), John Kay (Steppenwolf), Skin Sylvia Massy (Skunk Anansie), Van Morrison, Paul McCartney, Little Richard, Bruce Springsteen, CF Turner (Bachman Turner Overdrive), Tina Turner, Tom Waits, and Johnny Winter. Distortion in Edge is also mostly done at powerful volumes and is a very aggressive effect. It might sound as if the singer is screaming and about to be strangled at the same time. Sebastian Bach (Skid Row), James Brown, Chris Cornell (Soundgarden), Ronnie James Dio, Bob Dylan, Melissa Etheridge, Tramaine Hawkins, Etta James, Janis Joplin, ‘Baby Jean’ Kennedy (Mothers Finest), Skin Sylvia Massy (Skunk Anansie), Freddie Mercury, Tina Turner, and Steven Tyler (Aerosmith). Full distortion is 100% distortion. It is only ‘noise’ and no tone or mode. Full distortion is often used as an isolated effect in songs. James Brown, Joe Cocker, Terence Trent D’Arby, Janis Joplin, Bruce Springsteen, Tina Turner, Steven Tyler (Aerosmith) and Tom Waits.